While at Bull Creek on April 8th I mostly photographed waterfalls but was also happy to see a Clematis texensis vine with a trio of flowers on it. 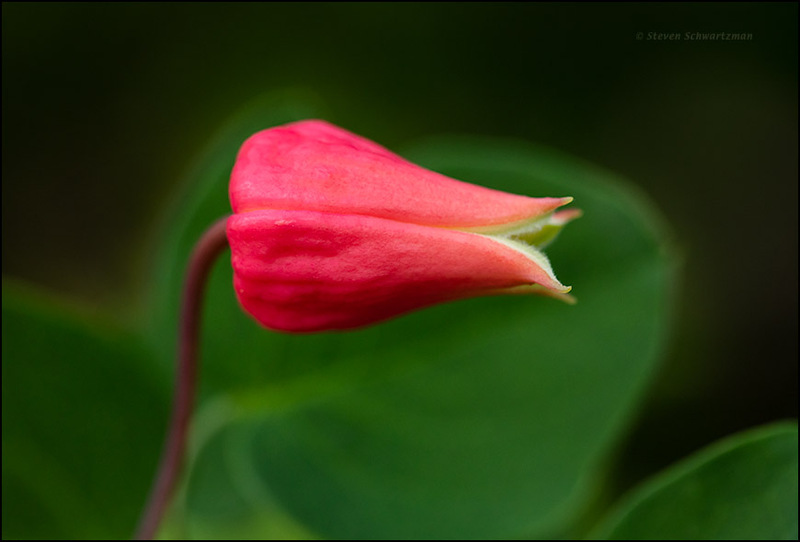 Anyone watching me at work that morning could have said: “He stoppeth one of three.” It could also be said that Austin is home to three native Clematis species, with texensis being endemic to the state’s Edwards Plateau. 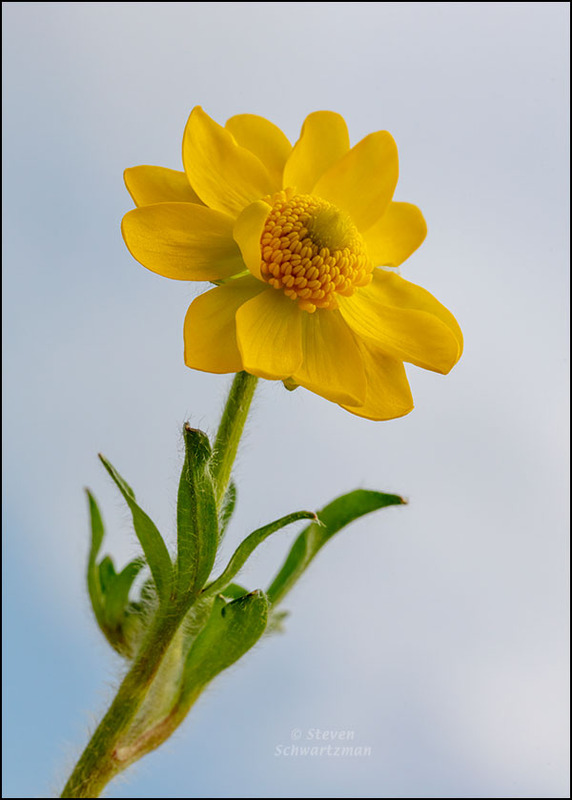 Above is the flower of a large buttercup (Ranunculus macranthus) along TX 123 south of Seguin on March 18th. 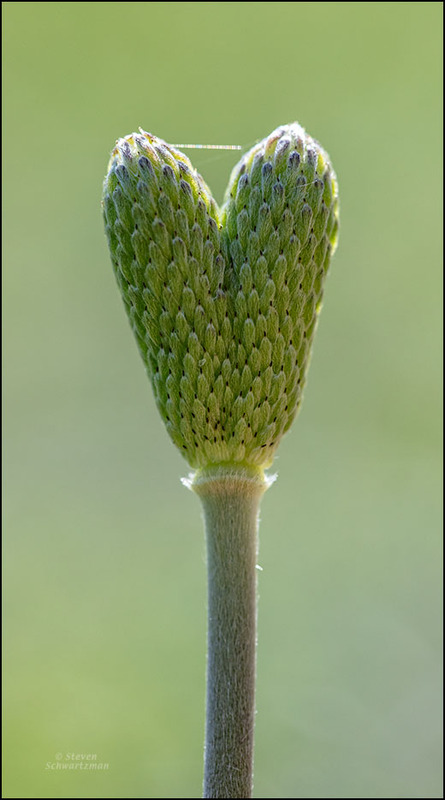 Below is a bud of the same fuzzy species. Both compositions share a sweep toward the top right, but while the first view is bright and looks upward, the second is darker and looks downward. 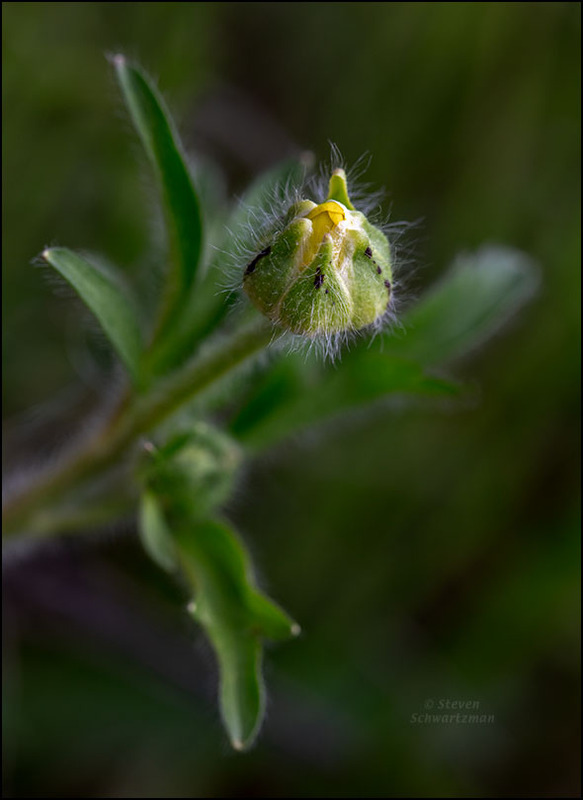 Behold the opening bud of a prairie fleabane daisy, Erigeron modestus, in my neighborhood on March 10th. Call it modest if you like; my mind sees flames. On March 10th I went back to the lot along Balcones Woods Dr. where I’d photographed the stemless evening primrose flowers you saw here not long ago. The highlight of my latest stop was a strange ten-petal anemone flower (Anemone berlandieri) that had two central fruiting columns instead of the one that’s normal. Some math-minded folks refer to today, 3/14, as Pi Day because 3.14 is the approximate value of π, the ratio of a circle’s circumference to its diameter. In other words, if you could lift a diameter out of a circle, bend it to match the curvature of that circle, then lay it back down onto the circle, it would take about 3.14 such curved segments to go completely around. π is what mathematicians call a transcendental number; one consequence is that we can’t express its exact value with a terminating decimal or even a repeating decimal (as, for example, 1/8 = exactly 0.125 and 1/11 = 0.09090909…). What’s all that got to do with this opening four-nerve daisy (Tetraneuris scaposa) that I photographed in my neighborhood four days ago? Well, 4 is a number, right? 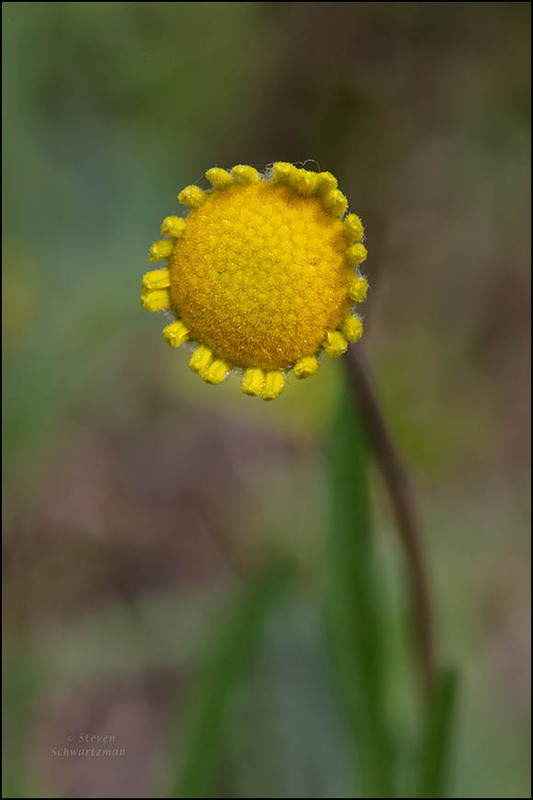 And you’ve gotta admit that the sunny yellow flower head does a good job of suggesting a circle. 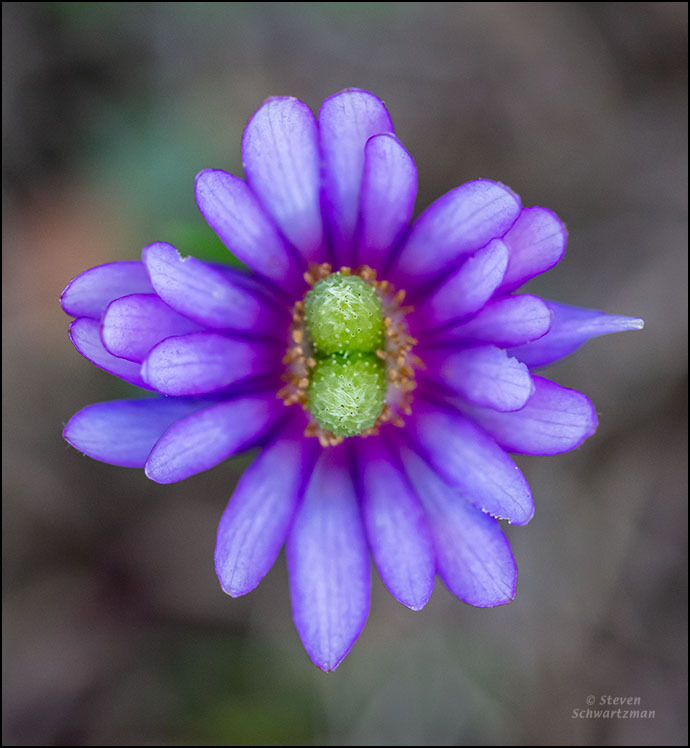 I inaugurated the new wildflower season here with a post showing a ten-petal anemone (Anemone berlandieri) that I photographed on January 28th. As each fertilized flower matures, a lengthening seed column develops in the center, and eventually the sepals fall off. That was on its way to happening to the anemone in today’s picture from February 18th. 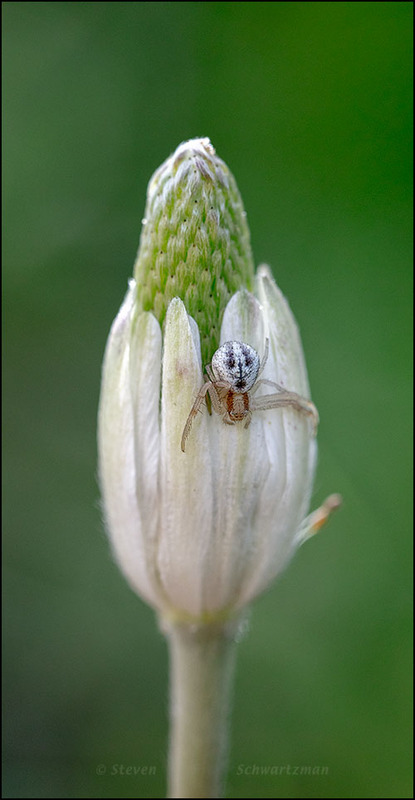 When I moved in to make my portrait, I discovered that a crab spider had gotten there first. Those of you inclined to pareidolia may well see a face in the upside-down spider’s abdomen. 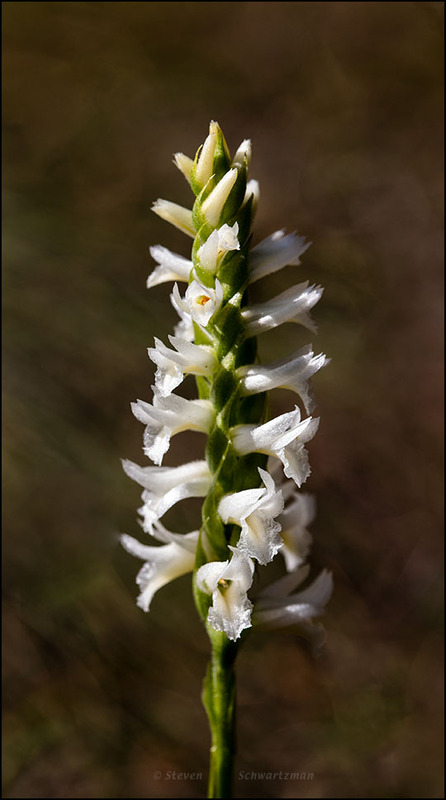 On October 22nd I checked out a site a few miles from home where I look for ladies’ tresses orchids (Spiranthes magnicamporum) in the fall. I didn’t find any. On November 17th at Wild Basin I located exactly two and photographed exactly one. What an exacting fellow I am.